Access: S.S. 203 Agordina up to loc. La Muda. Near the new road gallery, follow (on foot) the old SS road until you reach the track maintenance house (517m) near Pont de I Castei, and from here take a military road climbing with some hairpin bends and a constant slope. Once you reach a junction, leave the military road and, taking the flat trail on the right, you will shortly reach the drill ground of the blockhouse (595m). If you continue following the military road climbing with hairpin bends and galleries along Val Carbonere, you will reach the area of Pianàz (1,050m) on the mountain dominating Sass de San Martìn. Environmental context – Description of the site: the defense system of I Castei is situated in Val Cordevole and includes the whole Sass de San Martìn, a hillock (630m) of the north-eastern slopes of Monti del Sole mountain group. Situated in a strategic and dominating position near the northern mouth of Canale d'Agordo, in its most narrow point it gave the opportunity to watch over the area both from the south and from Agordo plateau. Situated at about 20 km from Belluno and 10 km from Agordo, it lies within the administrative borders of the Municipality of Rivamonte Agordino and within the Park borders. Building period: 1883-87 (the blockhouse, the mule track, and the defense buildings of Sass de San Martìn), 1915 (the military road climbing to Pianàz and the connected defense works, partly strengthened towards the end of the World War). Architectural features: works of military defense. Great historical-testimonial value. The defense system is formed by various structures reorganized in different periods, and is in general good conditions. The main building of the system I Castei is the "blockhouse" that was built at the end of the 19th century to complete a series of complex structures of defense against the Austrian-Hungarian invader. 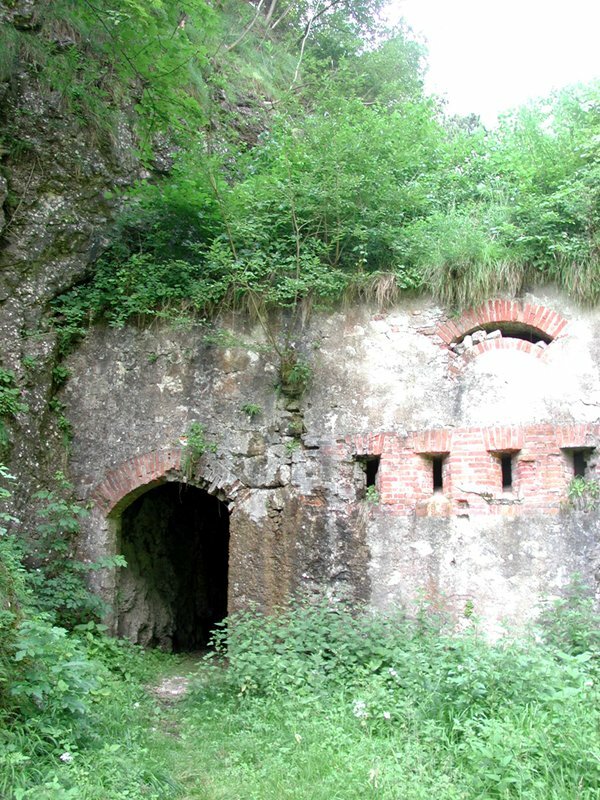 The blockhouse is a strong stone and brickwork building blocking a small saddle (fossil gorge) characterizing Sass de S.Martìn and is formed by four big rooms, covered with brickwork vaults and equipped with several rifle loopholes; the roof, which is no longer visible because of the vegetation, is in concrete. In the northern section, dug into the rock, there is a shelter for the cantonment of the platoons; in the middle, a huge subterranean reservoir represented the water supply. Next to the blockhouse, a mule track develops on the southern slope of Sass di S.Martìn, reaches the ruins of another building set into the rock, and continues to the top of the Sass where in the past there probably was an ancient small church dedicated to S.Martino. The buildings on the southern slope date back to another period: they were built in the years immediately before World War I, like the mule track, completed by the stóll system (term deriving from the German and used to indicate cavities and connections dug into the rock, used as shelter or for the military transfers), climbing towards the Pianaz. Abandoned military buildings, in a rather good state of conservation. Of the complex series of local defense structures, the fort of Tagliata San Martino is worth a mention. Contemporary to and connected with the blockhouse, it was built in the stréta de i Castei next to a bridge, and represented a real blockage for the eventual access of the Austrian-Hungarian troops from the north. Because of the events characterizing World War I, these buildings were not used; however, they were partly destroyed during the retreat after Caporetto. Along the stretch going from Pont'Alt to La Muda, the stretch of Canale d'Agordo with the greatest narrowing and for this reason very delicate from a strategic point of view, in November 1917 all the bridges were blown up, and the fort of Tagliata San Martino followed the same fate. In the Park area, you will find several military evidences; as a matter of fact, the territory, annexed to Austria from 1814 to 1866 (year of the plebiscite for the annexation of Venetia to the Kingdom of Italy), represented a border area until the eve of the Great War and was therefore particularly vulnerable and strategic. For instance, the military roads dating back to World War I are evident and widespread throughout the Park: they develop with a modest but constant slope, with hairpin bends with enough space for the maneuvers of the military means and sometimes imposing supporting walls. These roads were usually characterized by memorial stones along their borders: these stones are still visible also along the stretches that have been moved or where the track has been enlarged. The only two buildings that can be traced back to the past military events are the blockhouse of I Castei and the barracks of Forcella Moschesin (now in ruin). The area is also interested by the passage of two thematic itineraries of the Park: "La via degli Ospizi" and "Vie militari e antiche strade di minatori". The first one, already accessible, leaves from Certosa di Vedana and reaches Valle Imperina. It crosses the area of I Castei in the stretch climbing from Torner to the blockhouse and then goes down and crosses with a small bridge Val Carbonere, continuing northwards (information panels along the route near the main "laps"); the second one follows the route going from I Castei to Pianaz and ends in loc. Le Mandre (1,373m) and, in the first stretch, coincides with the previous one (for this itinerary there is a specific publication called "La Montagna dimenticata: vie militari e antiche strade di minatori" in the series "Itinerari" of Dolomiti Bellunesi National Park). AA.VV. - Sass de San Martin, C.A.I. Sezione Agordina,Grafiche Antiga, Cornuda 1993. Fontanive G. - La Muda Pont'Alt. Vicende di un tratto della rotabile agordina negli ultimi due secoli, Cierre Edizioni , Verona 1996.